How does the world stack up when it comes to gold? Due to the varying uses and purposes of gold, there are multiple ways to answer that question. 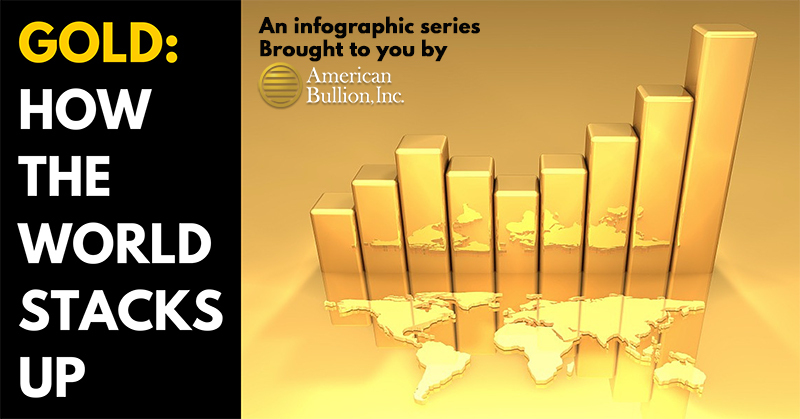 American Bullion answered it in the form of four infographics. Each infographic was shared in its own blog post. Now, take a look at all four as a series titled Gold: How the World Stacks Up. 1. Which Countries Hold the Most Gold? Most of the world’s central banks hold physical gold as part of their reserves. The first infographic in this series gives you the 10 countries whose central banks held the most gold as of March 2015. 2. Which Countries Produce the Most Gold? Gold mining is a truly global industry that makes up a significant portion of many economies. This infographic lists the 10 countries with the highest gold mining output in 2014. 3. Which Countries Consume the Most Gold? Gold is not only purchased by governments and central banks. Consumers like gold too, especially in the form of jewelry and investment (coins or bars). The third infographic in this series tells you which 10 of the top gold-consuming countries had the highest consumer demand for gold (jewelry and investment demand) in 2014. 4. Which Central Banks Are Buying the Most Gold? Central banks have recently developed a large appetite for gold, purchasing record quantities to add to their reserves. The last infographic in this series ranks the 10 central banks that were significant purchasers of gold in 2014. Perhaps it’s time for you to start accumulating gold as well. You don’t have to be a central bank, gold miner, or government official to do so – and it’s easy. Call American Bullion at 1-800-326-9598 to get started today.